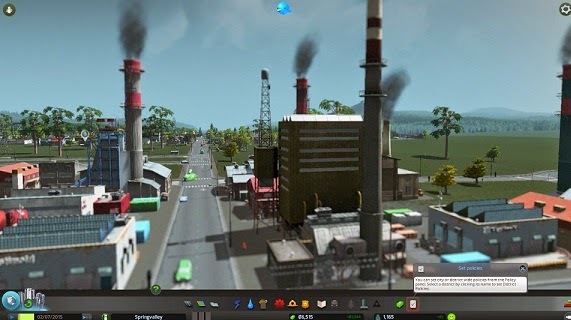 Cities: Skylines is a new way of urban management video game, developed by Colossal Order. Despite the similarity of their titles, we have a product that is not related at all, with the Cities series of Monte Cristo ... Well, except for the fact that they share the same theme. In fact, the game that today we review comes from a different series, Cities in Motion. On this occasion, the company has decided to stop focusing only on urban traffic management to extend the simulation options, putting in our hands the control of an entire city. We are faced with a title quite similar to most bids of the same gender, but do not expect a game traced to Sim City, or the recent Cities XXL. In Cities: Skylines find some new and original mechanical, which are quite interesting. Cities: Skylines proposes to build a city from scratch, so we will have to choose any of the maps we offer. For each of them, are different descriptive characteristics: Percentage of building land, availability of drinking water, fuel, wood, etc... These latter aspects influence the type of industry that can develop during the early stages of growth of our city. All initial maps have a road connecting the space available for construction with the outside. Thus, all games start building a network of roads that connect what later will our people with the rest of the world. And once that is done, we can begin the process of developing a city our size. We can build road types: Route of one, two or more lanes, two-way or one-way. Some types of roads adjacent feature decorations such as horse with trees, and can also be designed curved sections. Obviously, the more strokes and more complex, the greater will be the maintenance cost associated with roads. Any building you want to build, must possess an access from one of these pathways, except for some specific cases such as water supplies or wind turbines. Thus, to build a road a grid is displayed in the areas adjacent to it, occupying the right place to raise the various buildings at our disposal ... And considering that they are not all available from the beginning: We have to unlock new options as population increases. Using the standard popularized by Sim City, the game makes use of green-blue-yellow trio to identify the different areas building: Residential, commercial and industrial, respectively. In addition to these possibilities, we build another series of elements such as police stations, fire stations, hospitals, schools, public transport, parks, etc... These buildings serve to meet the needs of citizens in various aspects of their daily lives, such as security, education, health or leisure. As mentioned above, we must also take care of the power plants, water supply and drainage of clean and dirty water, garbage collection. Three bars at the bottom of the screen on the panel interface, show us the demand for construction of the three main areas mentioned, while for municipal buildings, we must be guided by the thematic maps. Cities: Skylines takes into account aspects such as wind or water direction, so we'll have to think about them when we go to building supplies, waste and wind power generators. If we make the mistake - for example - pouring sewage upstream of decision-supply, we are providing our neighbors contaminated water. In fact, both acoustic pollution, such as atmospheric or hydro - aspects to be taken into account during the construction of the city, keeping outlying residential areas of the nuclei of pollutants such as busy roads, factories or landfills. The environment is also important, and our citizens prefer to live near parks, tree lined avenues and close to basic services. Obviously, this will involve a significant expenditure of our resources, and this is where the work comes municipality management. This is where the districts involved. These are, without doubt, the most original element offers in Cities: Skylines. Using a brush tool, we have defined various areas of the city, they will receive a name. For each of these areas, we establish specific policies, creating districts with restrictions or exclusive licenses. This allows us to control various aspects of the city, both residential and industrial, with the idea of creating specialized areas. We can create a program aimed at young people neighborhood, taking some more permissive policies, or other neighborhoods designed for families. There is no limit to the number of districts, except our own management capacity. As for industrial areas, districts allow us to define the type of companies that will locate there: agricultural, forestry, oil or generic. Each produce a different level of pollution and noise, but also have different needs. Later, unlock residential, commercial and industrial areas of high density, allowing us to include more homes, shops or factories in the same space. Despite this increase of inhabitants per square meter, there will come a time when the space available we will being small ... Or interests us exploit other resources. Fortunately, in Cities: Skylines each map is divided into different areas of 1 square kilometer, so that we can acquire adjacent areas to expand our city or access elements which were available to us in the original location, such as forests, rivers, reservoirs oil ... You have to pay, obviously, but arrived safe time we will have the resources to do so. Not forgetting traffic management, especially when it has grown, creating public transport lines or watching the meaning and road capacity. A mechanical level, the game features some original ideas. Furthermore, the simulation is quite elaborate, especially aspects such as traffic or pollution. Colossal the Orders experience in this field, the game promotes behave quite correctly. Unlike other alternative genre, be strange that a small town quickly collapse due to traffic, because people automatically assess the possibility of taking alternative routes. The problem can occur when there are bottlenecks, but if we create a network of roads varied enough, we should not find them. Use of the districts is very original, and allows us to customize much the city. The information shown quite clearly, with many informative panels and thematic maps that influence almost every aspect of the game is presented. Until the citizens, using a social network like Twitter, they will give their opinion of our policies. Maybe you are missing a wider range of municipal buildings, especially with regard to energy and water, with more options to meet the same kind of needs. Also a way to engage more closely with neighboring cities, providing workers or acquiring and exporting products. These are aspects that to be found in other products of the same gender, and well implemented, give the simulation a much greater depth. Fortunately, Cities: Skylines is designed with full support for user modifications. This way, you can add new buildings, maps and scenarios. If the game is well accepted by creative community, certainly the number of options available will soon grow. In the case of the version to Steam, the game is fully integrated with Steam Workshop, which greatly facilitates searching and installing these modifications. Technically, the game features a nice graphic level, with lots of details and animations that really make us feel in front of a lively, dynamic and expanding. There are several buildings that give variety to the scene, pedestrians who walk through streets and parks ... The houses, businesses and industries are adapting to growth, and the city is always moving, always changing. The information is presented in a clear, either through icons or using different informative panels UI. At all times, we clear what is happening in the city, and what are the needs of our neighbors. The sound is not too varied, although rich in effects. Moreover, these are perfectly suited to the level of population, traffic or activity of each map area, complementing the game experience. Cities: Skylines is a very interesting, in a fairly consolidated alternative genre. After the nonsense of some recent attempts by other companies, Orders Colossal work presents a title without departing from standardized mechanical, has some character and dares to show some originality.